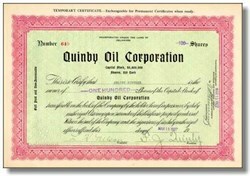 Beautifully engraved Stock Certificate from the Quinby Oil Corporation issued in 1927 for shares of common stock. This item has an ornate border around it. The historic certificate has the hand signature of the company's President, F.J. Quinby.